The organization was founded in 1992 by Ed Lazar with the help of various people including Joan Baez. Within a few months, a long list was assembled of internationally known Nobel laureates, thinkers, actors, politicians, and business and religious leaders, all of whom wanted to support the cause. This group of individuals became the Committee of 100. 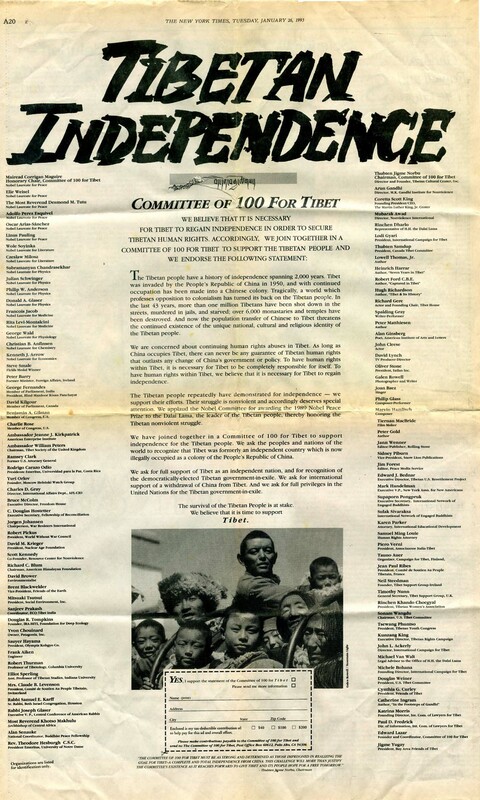 To bring the plight of the Tibetan people to the attention of the U.S. public, full page ads were run in the New York Times advocating independence for Tibet. During its first years, C100 focused on explaining the Tibet issue to the members of the newly formed Committee so they could speak out effectively, and educating the general public. C100 organized and sponsored discussion panels, information sessions, slide shows, musical performances and lectures. C100 also supported the preparation of written materials including the book Tibet: The Issue is Independence and published the monthly Tibet News Digest that was distributed electronically by the World Tibet Network (WTN). During the late 1990s, the World Wide Web created a new and exciting vehicle for communication. In 1998, Tibet Online, which had already provided the Tibetan Government-in-Exile's (TGIE) offices in Dharamsala with advanced Internet communications capabilities, joined forces with C100 to create a computer training center for Tibetan refugees in California and to further the information technology capabilities of the TGIE and the Tibet movement as a whole. In 2000, C100 helped launch the Hear Tibet! campaign that called for a United Nations supervised referendum in Tibet as a means to resolve the Tibet issue. The campaign concentrated on promoting a specific process for implementing self-determination for the Tibetan people. While Chinese officials publicly rejected such a referendum, by this rejection they acknowledged the question of self-determination. During 2002, C100 began to actively focus on the Tibetan people's fundamental right to self-determination: the underlying principle rather than any particular implementation. To support this new initiative, C100 helped establish the International Institute for Self-Determination (IISD) - a think tank whose mission is to provide an objective framework for thinking about the process of self-determination for all peoples. Together with the IISD, C100 is working to build consensus amongst Tibetans and their supporters around the principle of self-determination and, in doing so, help unify and strengthen the Tibet movement as whole. Throughout its history, C100 has sought to build consensus on the Tibet issue. Former long-time C100 chairman, Tenzin N. Tethong, spent over 30 years working within the exile Tibetan community, including holding the post of chairman of the Council of Ministers of the TGIE. He contributed to the establishment of many of the institutions and organizations associated with the Tibetan cause in existence today and continues to be extremely active in bringing together and communicating with a diverse set of Tibet support groups.